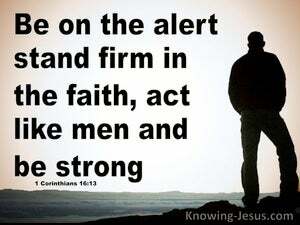 ﻿ 1 Corinthians 16:13 Be on the alert, stand firm in the faith, act like men, be strong. Be alert, stand firm in the faith, be brave and strong. Watch ye, stand firm in the faith, act like men, be strong. Be alert and on your guard; stand firm in your faith ( your conviction respecting man's relationship to God and divine things, keeping the trust and holy fervor born of faith and a part of it). Act like men and be courageous; grow in strength! 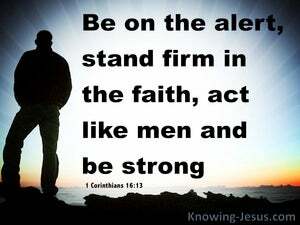 You people should be alert; stand firm in the faith; act like [godly] men; be [spiritually] strong. Be watchful, stand fast in the faith, be men, be resolute. 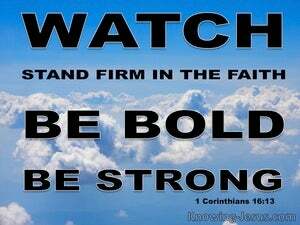 Be on the watch, unmoved in the faith, and be strong like men. Be on the your guard, stand firm in the faith, act like men, be strong. Be vigilant; stand fast in the faith; quit yourselves like men; be strong. 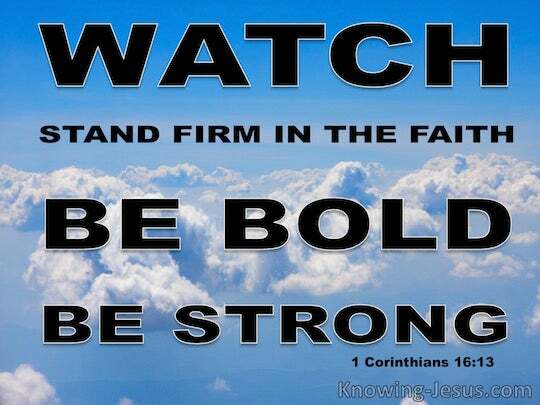 Watch, stand in the faith, be men, be strong. Be on the watch. Stand firm in your faith. Act like men. Show yourselves strong. Watch ye, stand fast in the faith, acquit yourselves like men; be strong. Watch ye, stand in the faith, be manly, be strengthened..
Be on the alert, stand firm in the faith, act courageously, be strong. Watch! 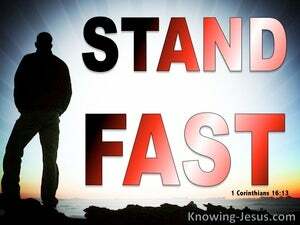 Stand fast in the faith! Be men! Be strong! Watch ye, stand fast in the faith, quit you like men, and be strong. Watch, stand firm in the faith, play the man, be strong! Be watchful, stand firm in the faith, be manly, be strong. Watch. Stand firm in the faith. Be courageous. Be strong. 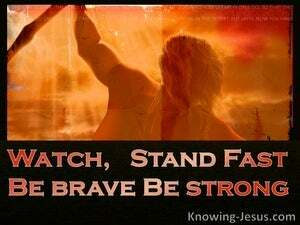 Watch ye, stand fast in the faith, be manful, be strong. 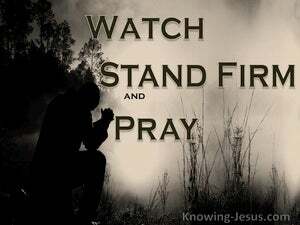 Be watchful; stand firm in your faith; show yourselves men; be strong. Watch ye, stand fast in the faith, acquit yourselves like men, be strong. Be on the alert; stand firm in the faith; acquit yourselves like men; be strong. 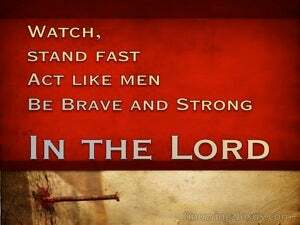 Watch, stand fast in the faith; be men; be strong. 12 But concerning Apollos our brother, I encouraged him greatly to come to you with the brethren; and it was not at all his desire to come now, but he will come when he has opportunity. 13 Be on the alert, stand firm in the faith, act like men, be strong. 14 Let all that you do be done in love.